In 2014, I was in New Zealand to speak at a literary festival. With a couple of hours to spare, I went into the Auckland Art Gallery, admired the splendid Maori canoes, and then wandered upstairs to the collection of European art. I was standing in a room full of 18th-century portraits, when I saw – visible three rooms away through an enfilade of archways – a painting that I knew at once, even at that distance, must be by my mother-in-law, Suzanne Cooper. Her style is unmistakable. It was like bumping into a dear friend, unexpectedly, thousands of miles from home. The painting, Royal Albion, was hanging alongside others by better-known British artists Christopher Wood and Alfred Wallis. I’m partial, but it seemed to me the best of the three. The label had Sue’s name right, but her date of birth was out by more than 20 years, and there was no further information. I went back to London thinking that if, on the other side of the world, her art was considered to be museum quality, then it was time we in her family did something to tell the world about her. So we did: tomorrow marks the opening of her first ever solo exhibition. I’d known and loved Sue’s work since I started going out with her son, the publisher Dan Franklin, in the Eighties. Her eerily surreal The Cat Girl, with its touch of Balthus-like unease, hung in the sitting room of his London flat. When we went down to Much Hadham, Hertfordshire, for the first, awkward, meet-the-parents Sunday lunch, I saw more of her pictures. There were modernist street scenes full of vigorous lines, flat planes of singing colour and dynamic movement; still lives in which flowers and sea shells were made fascinatingly strange; wood engravings where the inventiveness of the composition is matched by the variety and exuberance of the marks. In her 20s, Sue had been a rising star. She studied at the Grosvenor School of Modern Art in London, where she was taught by the master printmakers Iain Macnab and Cyril Power. 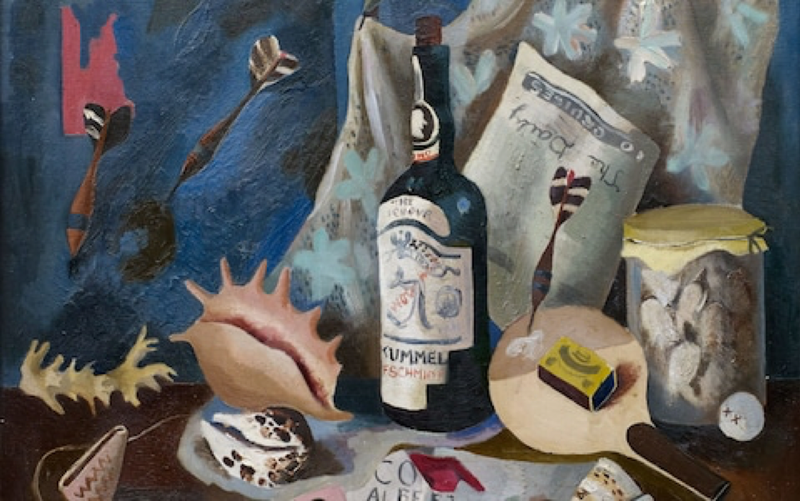 Over her four years there she exhibited oil paintings and wood engravings in group shows at respected London galleries: the Redfern, the Zwemmer and the Stafford. Macnab recognised her skill as a wood engraver, and treated her as both a favoured protégée and as a peer, affectionately inscribing a book to her, “From one Woodpecker to another”. The influential collector Lucy Carrington Wertheim bought two of her oil paintings and showed others in her gallery. But then came the war. In 1939, the Grosvenor School closed down and Sue’s career came to an abrupt halt. She married Michael Franklin in 1940. While he was away, fighting in Italy, she worked as a volunteer nurse. On his return at the war’s end she apparently felt, like so many women of her generation, that her first priority was to be a good wife to him. They settled in Hertfordshire and had three children. She continued to make small pictures in pastels and crayon, but she did no more oil painting, no more engraving. When people asked her why she didn’t carry on painting, she would act as though it was a foolish question. That part of her life was over. Why that had to be, she couldn’t explain. Her story relates to two larger narratives. One is about the young artists of the Thirties whose potential was never realised – in many cases because they were killed fighting; in others, because their artistic development, interrupted by the war, lost momentum. The second story is about the many women of her generation who felt unable to say, “I am an artist. This is what I do.” Almost any male artist of her calibre would, I believe, have found a way of getting back to work once the war was over. Not Sue. She laid aside her ambitions, settling for the role of wife and mother, and – always reserved, and dismissive of her own remarkable talent – hid half her canvases under the spare-room bed until her death in 1992. Although it’s sad that she is not here to see the new exhibition, I suspect it would have been hard to organise it in her lifetime, in the face of her self-deprecating insistence that her art was nothing worth bothering about, that she didn’t want anyone making a fuss. I’m glad though, that her beautiful pictures – so formally innovative, so full of vitality and complex charm – have finally reached the public. The rediscovery of an artist whose talent has long been lost to the world is a rare and exciting event. Suzanne Cooper is one such artist. Despite her startling early promise, we have only a modest number of works to remember her by, but these have now been brought together to receive their due in a revelatory show. Brought up in Frinton on the Essex coast, in 1935 Cooper enrolled at the Grosvenor School of Modern Art in Pimlico, London, aged 19. This appealing-sounding institution had been established in 1925 by the Scottish wood-engraver and painter Iain Macnab, in his house in Warwick Square. Its students were allowed a remarkable degree of freedom, choosing between life drawing, the study of modern art (the critic Frank Rutter taught a course ‘From Cézanne to Picasso’), classes in composition and design, or dancing, taught by Macnab’s wife Helen Wingrave. The 1920s were a golden age for wood engraving, with initiatives such as St Dominic’s and the Golden Cockerell Presses, and Iain Macnab was one of the pioneers. his own incisive and dynamic linear style was taken up by students including Sybil Andrews and Cyril Power, and adapted to lino-cut with well-known results. It was woodblock engraving, however, that Cooper mastered with such dexterity under Macnab’s and Power’s tutelage. eleven exquisite and sophisticated prints survive this brief period of the late 1930s, when her powers as an artist were at their height. Macnab was plainly entranced by his talented protégée’s work, inscribing a copy of his book on engraving to her with the words ‘From one woodpecker to another’. There is no record that her path crossed with those of contemporaries Eric Ravilious and Edward Bawden, although stylistically her work shares much with theirs. Nor is there any mention of her in the public record among the luminaries of the Grosvenor School. 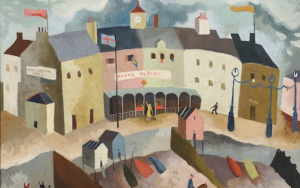 Cooper was also painting in oils at this time, drawing on her vivid imagination as much as on memories of travel and childhood to produce animated street and harbour scenes. Undoubtedly influenced by the Modernism of Christopher Wood, she combines simplified blocks of colour with dynamic brushwork and her naive figures going about their daily lives bring a storybook charm and humour to her work. Royal Albion conjures the frontage of a quintessential British seaside town, with a maid shaking a cloth out of the hotel window and a dog walker and horse riders on the beach below. The blustery weather is evident from the scudding clouds and flapping flags, waves swell on the shingle and it is plainly too rough for the fragile boats to go out on the tide. Brixham Harbour is full of delightful details. A moustachioed old tar’s dog snoozes on the quayside; an earnest artist with his palette and an incongruous public sculpture frame the composition, which is articulated by the decorative verticals and diagonals of masts and rigging. Such paintings were exhibited at prominent London galleries, among them the Redfern, Zwemmer and Wertheim Galleries, the latter established by the patron Lucy Carrington Wertheim, who recognised Cooper’s potential and gave Royal Albion to the Auckland Art Gallery in New Zealand in 1948. Three years ago, Cooper’s daughter-in-law, Lucy Hughes Hallett, was amazed to stumble upon it still hanging there, alongside works by Wood and Alfred Wallis. Amazed, because, like her wood-engravings, Cooper’s paintings have largely disappeared from public view in the years since the Second World War. She married Michael Franklin in 1940 and settled down to family life. With three children, she abruptly gave up painting and engraving, barely mentioning her former passion and confining herself to a little work in chalk and pastel. Her children inherited 14 paintings on her death in 1992 and they know that there must be more works out there, sold in the 1930s and now lost to view. They have, however, discovered 11 woodblock matrices for her engravings, which are in such good condition that they have been able to re-edition all the prints.